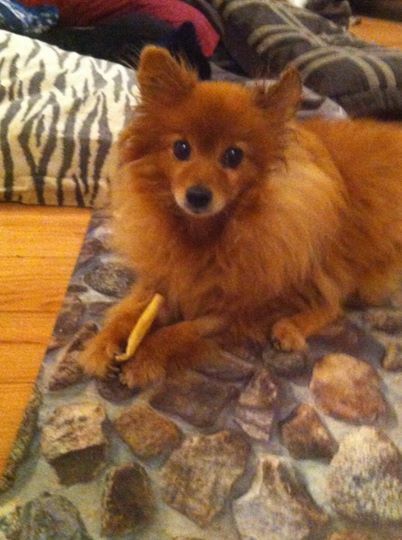 Josie is a 6 year old Pomeranian and is the first recipient of funds from “In Memory of Maggie May”. Josie was surrendered by the breeder in February 2013, she was then adopted but sadly returned because the adopted parents “did not have time for her”. Josie then went into foster care, where her foster mom fell in love and last fall, adopted Josie. Josie’s mom says after time, her “personality started to shine, she became happy, she was no longer terrified, and smiled when she played”. But, suddenly in early June, Josie began to have seizures, and losing mobility of her hind legs. She was diagnosed by a Neurologist as having Meningitis and began treatment. We were approached by Josie’s mom for financial assistance and although we did not have an official process in place, we reviewed with Dr. Maja, and felt compelled to help. Josie’s mom would not accept euthanization as an option….and says, ”I will do everything in my power and in her best interest before I would even consider this option. To not do anything and just give up on her was not an option. She finally found happiness and ending her life without trying just wasn’t going to happen. She keeps trying to get herself up, she keeps moving and I know she’s not done fighting and I won’t stop fighting until she tells me”. Josie’s Neurologist is very happy and amazed at her progress and we are excited to report that Josie is now walking and moving more each day. Josie has a long road ahead of her, and we are proud to have helped Josie get to this road of recovery. Josie’s mom is writing a blog about Josie’s story, her “miracle”. She wants to encourage people not to give up even though they feel defeated. We admire her dedication and Josie’s will to survive. We will be following Josie’s progress and posting updates! UPDATE – September 2016 – JOSIE DIAGNOISED WITH CHRONIC LYMPHOCYTIC LEUKEMIA.